Fred Mezger observed this woodpecker taking insects and/or nectar at flowers of a Saguaro Cactus (Carnegiea gigantea) near Buckeye, Western Maricopa Co., Arizona, USA. May 2011. He kindly submitted his photo for use on the Sonoran Desert Naturalist. This large woodpecker with a distinctive black bib is a close associate of saguaro cactus forests in the Sonoran Desert. Look for a yellow patch in the wings when in flight. The face is gray and the belly and lower chest are strongly spotted. 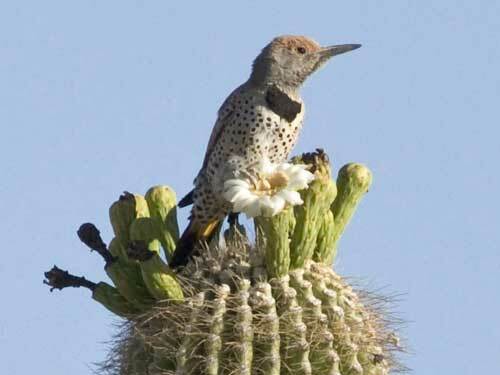 With their strong, heavy bill they can excavate a large cavity in a saguaro for use as a nest hole. These holes sometimes weaken the cactus such that the top portion breaks off during a wind storm. This event can sometimes lead to the death of the cactus because of entering rain water and systemic infection. 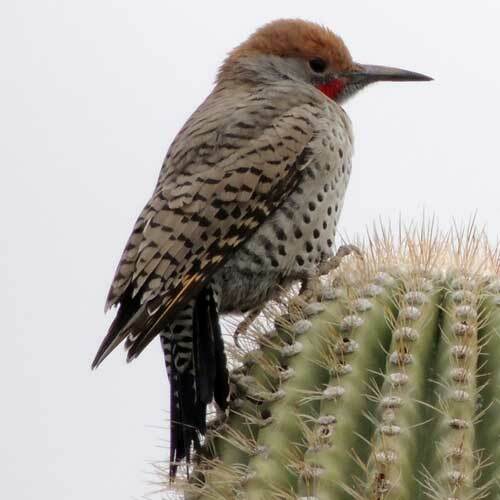 Loud, sharp calls of flickers carry for a kilometer or more and are one of the characteristic sounds of the Sonoran Desert. Flickers feed especially on ants, and the Guilded Flicker is no exception. They will also feed on pollen, nectar, fruit and other insects. The male differs from the female in having a slash of red on the cheek. Notice how the stiff tail feathers serve to support the bird's perch. Observed at Cave Creek Regional Park, Maricopa Co., Arizona. January 2014.